I’ve shared a few of my tips for how to freeze cookie dough in the past, and I wanted to revisit it again as we move into the holiday baking season. I’m planning on doing a couple of “dough makes” in November, as one way to stay ahead of myself once the crazy holidays hit. I’d love to have several batches of dough in the freezer for when those last minute cookie swaps and class parties sneak up on me. Also, I much prefer to make one big mess when it comes to baking and always prefer to double and triple batches of everything I’m baking. Less flour-y mess! Let the dough sit for 24 hours before baking. Before you call me crazy, try it. Once. See if you notice a difference. Simply scoop out a small dough ball’s worth and place onto a piece of wax paper on a baking sheet. Flash freeze for 20-30 minutes, then transfer dough balls to plastic freezer baggie. You could also lay the balls flat in a plastic freezer baggie and freeze them in a “tray form.” Freeze, up to 3 months. To cook, pull out the ones you will cook and place them on the baking sheet and let them warm up some while the oven preheats. I’ve found that if they just get a few minutes out of the freezer to warm up to room temp, the baking time does not need to be modified from the original recipe. If you are taking them straight from the freezer to a hot oven, I’d add no more than 2 minutes of cooking time…watch them closely as to not overbake! If you’re wanting to make cookies using the “slice and bake” method, then I recommend freezing the dough in a log shape. 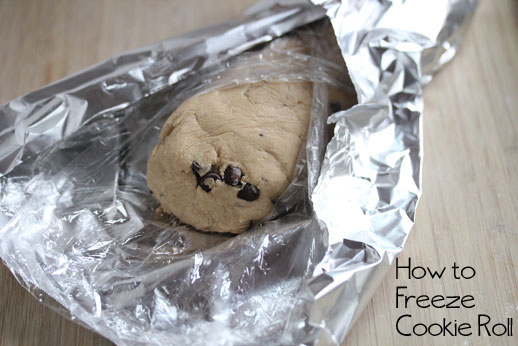 lay out a piece of aluminum foil and then a sheet of plastic wrap over the foil. Drop the dough onto the plastic wrap and shape into a circular log, much like the “rolls” that you purchase at the grocery store. Press until it’s uniform in shape. Wrap the plastic wrap around it and twist off the ends. Then wrap the foil around the plastic wrap. Freeze, up to 3 months. To bake, slice and bake as directed in the recipe. Thicker slices may require an additional 1 to 1 1/2 minutes of cooking if the slice is mostly frozen. Also, I highly recommend the book, The Cookie Party Cookbook , if you’re considering hosting a cookie swap…or what to take some cookies that will impress everyone there! I should do this since we are cookie eaters in this family. Maybe on Thursday cuz I need cookies soon. They make great snacks and I know what’s in them! 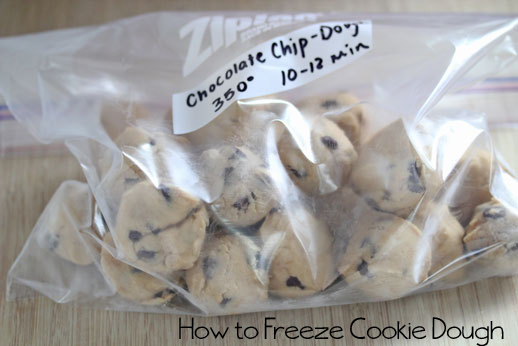 I just stumbled on this post as I was looking for a good way to freeze cookie dough since I never have before. Do you think this will work with Oatmeal Scotchies? 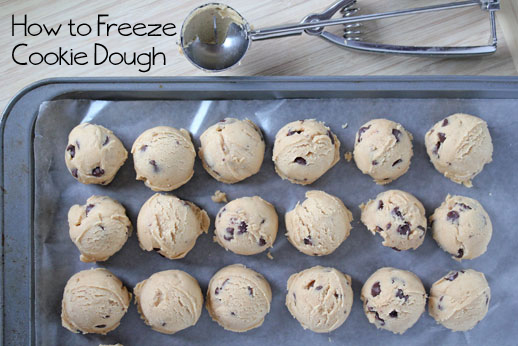 I love the idea of freezing cookie dough to have on hand! Just one question, does this method work with the Nestle chocolate chip cookie recipe? I have been doing this for years. I actually start mixing cookie dough and freezing it in August for Christmas cookies. I have never ever had any problems with them going bad. I make sure I double wrap the dough and get all the air out of the freezer bags. I have only ran in to a couple types of cookies that don’t freeze well (right off the top of my head I can’t remember which ones, LOL). I actually freeze a lot of stuff, potato chips, eggs, avocados, cereal, flour, sugar (brown, white & powdered), the list goes on.